With high stakes and mysterious characters, Gilgamesh is an action packed anime that will have you constantly switching loyalties. The Epic of Gilgamesh is one of the oldest texts ever found, dating back to around 3000 B.C. 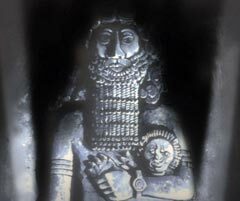 It tells the story of the warrior king Gilgamesh, ruler of the ancient city Uruk. Gilgamesh and his best friend, Enkidu go on many adventures together, while fighting monsters and outwitting the gods. Eventually, their trickery catches up with them and Enkidu is stricken ill by the gods and dies. The story then turns from being an ancient action/adventure tale to something more philosophical, as Gilgamesh mourns for his friend and fears for his own mortality. He sets off on a journey to find a way to defeat death and to escape Enkidu’s fate. 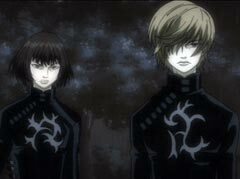 The characters in the anime Gilgamesh are familiar with the story. The show starts off deep underground, where a team of scientists are excavating Gilgamesh’s tomb. The tomb may be an entrance to another world, and scientists all over the globe have come to try to unlock it. One of them is Terumichi Madoka, a Japanese scientist with a wife and young daughter. He discovers that going any farther with the excavation could cause the end of life on Earth as we know it, and on his advice, that whole operation is shut down. Soon after the order is given, Dr. Madoka inexplicitly goes ahead with the project, despite his own warnings, and releases chaos into the world. Everyone is shocked at the doctor’s seemingly uncharacteristic actions. Is he, like the Gilgamesh of ancient times, trying to find the secret to immortality, or is he after something totally different? To most people, the Sheltering Sky is a constant reminder of the attack against humanity by Enkidu, as Dr. Madoka is now known. To the younger generation, however, it's the only sky that they've ever known. Two of these children are 14-year-old Tatsuya, and his older sister, Kiyoko. The two siblings are on the run from thugs intent on making the kids pay back their dead mother's debt. When they take shelter in an abandoned house to escape their pursuers, they meet three mysterious young men in identical black costumes. After dispatching the loan sharks, the men ask Tatsuya and Kiyoko to join their cause against the evils of the world. The teens win the fight, and Kiyoko and Tatsuya are taken to meet the three kids' employer. 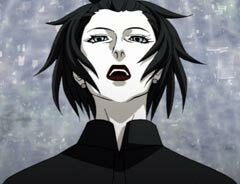 The Countess Werdenburg is an elegant, wealthy woman who is leading the fight against Gilgamesh and Enkidu. She wants Kiyoko and Tatsuya's help in the war, figuring that the two have powers that could be valuable. The brother and sister would rather not have to fight for either side, but it's hard to stay neutral when your father is Enkidu, one the most infamous terrorists on the planet. It's easy to feel sympathy for Tatsuya and Kiyoko as they are fought over by the two warring sides. It's nearly impossible to discern between the good and bad guys, as the true intentions of these groups are left unclear. Add in conflicted family feelings, with their father leading Gilgamesh's side, and it's clear that both Tatsuya and Kiyoko are in a tough situation. To make matters worse, they may be losing each other as well. 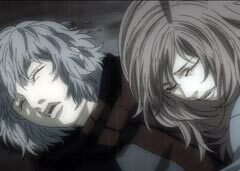 With their mother dead and their father a fugitive, the brother and sister had to rely on each other while growing up. Their bond is so close that they often have the same reaction to things, think the same thoughts and have the same dreams. Whenever one of them is depressed, the other knows exactly the right thing to say to cheer them up. Even their body language shows how similar the two are. This starts to change when the Countess takes them in. Under the Countess' guidance, Tatsuya starts to discover his psychic powers, while Kiyoko is left alone, as her powers are not as apparent. 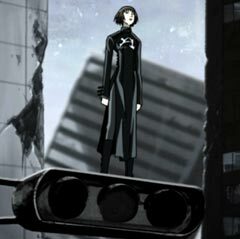 As Tatsuya grows stronger and spends more time with the other super-powered children, a divide starts to grow between the siblings. How this will affect the war between Gilgamesh and the Children of Orga is unclear, but it doesn't look good for Kiyoko and Tatsuya. The anime only spends as much time as it needs to on the family feud in order to get to its action scenes. There's a fight in every episode so far, with the Gilgamesh monsters facing off against the Children of Orga. The children's powers are pretty much like every psychic power seen in anime, with telepathy and the ability to send out energy blasts at their opponents. The monster forms are interesting in design, and they make the fights more visually interesting. Fans of the action found in X would probably enjoy the skirmishes in Gilgamesh as well. Although it spends a lot of time on the action scenes, the show works best when it's utilizing it's more original aspect, the mixture of sci-fi and horror. The faces of the characters seem specifically designed to scrunch up in terror at every new discovery, and they do. The settings are creepy, whether it is the decaying post-apocalyptic world or the almost too perfect Hotel that the Countesses and Children live in. The show is at its most engaging when it's trying to scare you, using fancy camera angles or just good old thunder and lighting to make the viewer jump. The music also helps the eerie atmosphere. The main score is very cinematic and tension builds with a steady drum beat and foreboding horns. When the action scenes occur, the tension is notched up even higher with faster paced music with a middle-eastern influence. The music for the series is great, but the opening song, "Crazy 4 U" is a fast paced J-pop song that seems better suited to a romantic comedy, or just about anything other then Gilgamesh. The end song, "The Forest of Lost Memories" fits the series better, and even offers a bit of hope for the two main characters. 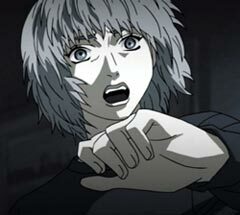 The animation is attractive, despite being a rather bleak show of mostly grey colors and shadows. The occasional use of CG is done really well, although it's only been used sparingly in the first few episodes. The character designs are detailed and extremely androgynous; it’s hard to say for sure what someone's gender is until it's stated by another character. Currently, the first volume of this series has been released by ADV, so if you are intrigued by this action/sci-fi/horror, check it out!